Classic Colorado Home, Red Cliff Views, Close To Attractions, Dog Friendly! Nestled among some of the oldest Ponderosa Pine trees, and with magnificent views of the red cliffs of the Animas Valley, the Ponderosa House is the perfect get-away destination for those who seek to discover Durango, Colorado and the Four Corners region. 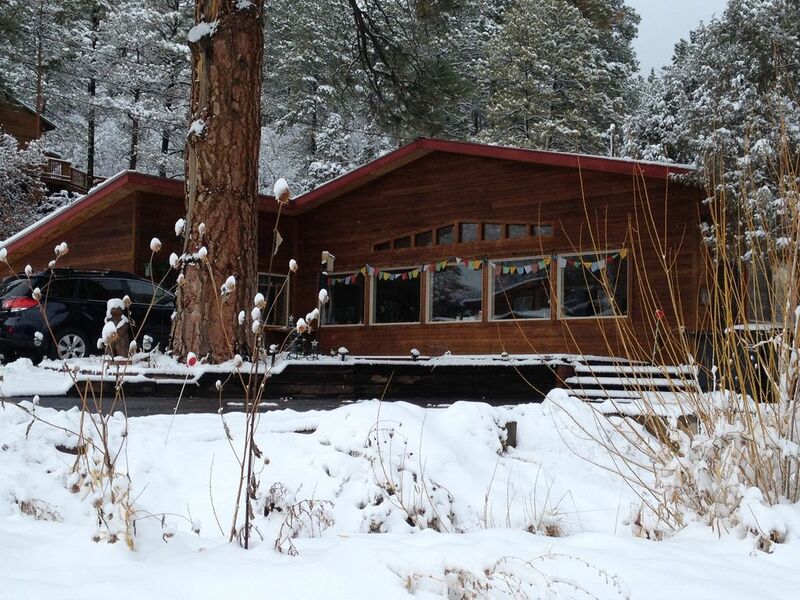 The Ponderosa House is our home and not a sparse, time-share space nor an impersonal hotel room. Originally built in 1938 as a one-bedroom cabin, two renovations have increased the living space and added a master bedroom and bath. Many of the cabin’s original character points still remain including bead board ceilings, rustic built-ins and a 1950’s metal kitchen cabinet. The Ponderosa House is approximately 1500 sq. ft., sleeps 6, has a great room, two bedrooms, two bathrooms, an office/reading room with gas fireplace, open concept kitchen, a utility with a washer and dryer, wrap around deck and a small fenced yard for your dog’s convenience. You have a private entrance and 2 parking spaces. The newly updated kitchen has granite counter tops and a 5 -burner gas stove with griddle and a convection option oven. The full size refrigerator includes an ice maker. Cabinets are stocked with bake ware, pots and pans, an abundance of cooking utensils, Fiesta table ware and an assortment of spices, and flour. There is a large microwave, 10 cup coffee maker, toaster, a large crock pot, casserole and serving dishes. The great room’s wall of windows fills the room with natural light and provides views of Missionary Ridge. The floors are Saltillo tiles from Mexico, have in-floor heating and are warmly covered with rugs. A 42' HDTV flat screen television, DVD player, DISH Network, WIFI with high speed internet, an extra HDMi connector for your gaming unit, and an mp3 player speaker bar keep you entertained and connected. Relax on the full size couch, or the love seat sleeper sofa (which converts to a queen sized bed) and expect to fight over two of the most comfortable leather recliners on the planet! Our Ethan Allen British Classics dining room table will seat 10 guests when two leafs are added. Hanging above the table is a 1900’s stained glass light. Our French Country designed master bedroom features a Sterns & Foster queen sleigh bed with a Tempurpedic mattress pad, Ethan Allen dresser, original artwork, and black out drapes. Plush linens, additional 500 count sheets and comforters are provided. The on-suite bath was remodeled in 2012. Step out onto the deck for magnificent red cliff views, and enjoy the seasonal stream. The Cabin room is a rustic bedroom decorated with family antiques and collectibles. It has a queen size bed and a window that sports a views of the San Juan Mountain range. You will find books to read, movies to watch, a cozy nook next to a gas fireplace to sit and contemplate and a roll top desk to use if you must! Your host is located in a suite next door and can provide you with printing service as well as help with any questions or concerns. CLEANING: Guests can expect a clean and welcoming space with clean towels and sheets, dusted furniture, disinfected bathrooms (sinks, showers, toilets) kitchen counters, stove, refrigerator & appliances. We disinfect light switches, door knobs & remotes. Floors are swept & mopped. Carpets are cleaned four times a year or as needed. If you find something is not to your liking, please contact Candace immediately1 We strive for 5 star reviews! Year-round opportunities for adventure are just outside our door. Nordic adventures are just 20 minutes north at the Durango Mountain Resort (Ski Purgatory). Trimble Hot Springs Spa, open year round, has a swimming pool, hot springs pools, a full service spa and is located ½ mile south. One of Durango's most beautiful public golf courses, Dalton Ranch, is within a mile. Historic Downtown Durango and the Durango-Silverton Narrow Gauge Railroad are 12 minutes south. Durango's nightlife is legendary with many local breweries and gourmet restaurants. Floating down the Animas River on a hot summer day is truly a bucket list experience. Just a couple of miles north is James Ranch, a sustainable working ranch with the best burgers and organic produce in the area. History lovers will find the ancient dwellings of Mesa Verde captivating. Movie buffs can stand where Butch Cassidy and the Sundance Kid jumped off a cliff at Baker’s Bridge or at the historic Strater Hotel, see the cash register where Clark Griswold stole money in National Lampoon's Family Vacation. Make sure your camera is charged, as our home in the mountains is also home to deer, elk, bear, wild turkeys, an assortment of chipmunks and hummingbirds. Rock hunters, there are thousands of closed mines with tailings waiting for you to sift through them! PJ's Gourmet Grocery and a liquor store are located within a mile. Ask about our pre-arrival grocery service and your favorite snacks and beverages will be waiting for you. Your host is a retired hotelier who chose this remarkable property as a place to retire. She lives on property in a studio on the west end of the House. Come visit our mountain paradise to seek your adventure and renew your spirit. Check-in after 4:00pm Check-out 10:00am. Your host is a retired hotelier who chose this remarkable property as a place to retire. I am an avid photographer and love to rock hunt! Come visit our mountain paradise; seek your adventure and renew your spirit. As a rock hound and amateur geologist, the first time I drove up US 550 and saw the glacier cut valley on the north side of Durango, with its towering red and white cliffs, my heart jumped! I looked at houses up and down this valley until I found the perfect place for me. To be able to share this piece of Paradise with visitors is a humbling experience. If you need or would like to have certain food and beverage or flowers in the House or Cottage before you arrive, I am happy to do that. You have the comfort of being a guest at my home while having the privacy of your own accommodations. The linens are fresh and the view delightful. You won't have anyone above nor below to keep you awake. You are out of town, yet close (10 minutes) to downtown. The on-suite master bath was remodeled in 2012. There is plenty of storage, plush towels, hair dryer and shower soap, shampoo and conditioner, travel sized necessities. The 2nd bathroom has all the same amenities as the master bath, however, it also is home to the washer and dryer. We have ceiling fans, window fans and standing fans if needed. Our location on the West side of the Animas Valley provides an excellent cross breeze even in the hottest weeks of summer. We have in-floor heating in the living areas, baseboard heat, a gas fireplace, and electric fireplace. High efficiency detergent required (supplied). Not a commercial, so please don't over load or place oily materials in washer. Coin laundry in Durango. Large dryer with Downy anti-static dryer sheets provided. plush towels, and plenty of them! Eclectic collection of fiction, non-fiction, travel, history, music, paperbacks and hardbacks for use during your stay. Please leave books here for next guests. There is a seasonal stream that runs next to the house. Deck chairs are provided to enjoy the mountain views. 1/2 mile South is Trimble Hot Springs & Spa. Open year round. We hope you will feel like you are visiting with friends when you choose to stay at the Ponderosa Pine House! We provide a manual for the house that includes everything from television instructions to brochures and recommendations of our favorite restaurants and things to do and see while you are in Durango. Check in - after 4:00pm Check-out 10:00am. Year-round opportunities for adventure are just outside our door: hiking/bike trails on property, Nordic adventures just 20 minutes away at the Durango Mountain Resort (Ski Purgatory); Trimble Hot Springs Spa is within walking distance; one of Durango's most beautiful golf courses, Dalton Ranch, is within a mile; Historic Downtown Durango and the Durango-Silverton Narrow Gauge Railroad is 10 minutes away. We are proud to never have had a problem with guests nor have they had any issues with us, however, upon booking, you agree to hold harmless Candace Richerson and the Ponderosa Pine house for any damage to your property or injury incurred on the premises during your stay. We require the $49 insurance policy for your protection and well as ours as accidents do happen in life.